Choose a New Level of Service With American Maintenance & Supplies, Inc. When you choose American Maintenance and Supplies for your janitorial service you’re getting much more than just a cleaning company. You’re choosing the company that can meet a variety of needs. In fact, we have been called the “Facilities Concierge Service” because whatever the request, we have a creative solution for you. Find the Hidden Safety Issues in Your Facility Today! Just how safe is your facility? Did you know that about 3 million nonfatal workplace injuries occur each year? OSHA required employers to provide a safe workplace. Are you confident that if OSHA showed up on your doorstep tomorrow you’d pass with flying colors? 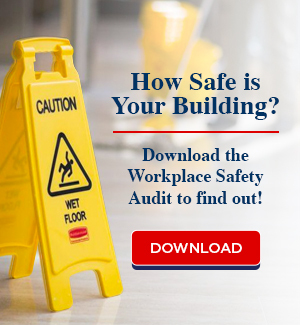 Download the Workplace Safety Audit now! American Maintenance & Supplies, Inc. specializes in office cleaning, hotel cleaning, specialty cleaning and school cleaning. Our service area includes Northern New Jersey and surrounding areas including Bergen County NJ, Essex County NJ, Hudson County NJ, Manhattan NYC, Rockland County NY, Brooklyn NYC, Bronx NYC and Queens NYC. Customer focused office cleaning services from a family owned business for over 50 years. Customer service is our #1 priority – all employees receive customer service training to ensure we are available when you call any time of the day or night. We make sure your concerns are handled quickly and effectively. Why keep hiring one janitorial cleaning service after another when you keep getting the same poor results? It is our duty to take a proactive approach when it comes to cleaning. Services include office cleaning, floor cleaning, carpet cleaning, window washing, porter services, handyman services, pest control, snow removal and more. Facility Managers have a lot on their plates – we get that and make it our mission to make your job easier. Whatever the challenge, we’ll help you resolve it with a creative solution. We are the ‘go-to’ company for your facility needs. If you don’t have the needed resource, we’ll either handle it for you or provide a referral to someone who can.